A disappointing return for a band with undoubted talent. Having established a relatively unique sound in rtheir previous outings For The Fallen Dreams have lost two members, one of which was the principle rsongwriter. This is altogether obvious in Back Burner. While there is no obvious step down in the technicality rof musicianship the songs don't seem to flow as nicely as before, often seeming a little disjointed. While rlead vocalist Dylan Richter's screams have improved tenfold the prevalence of clean vocals has increased rtenfold. The clean vocals leave much to be desired. Fist Fight is the only real outstanding track on Back rBurner. listen to what steven spedding said, he speaks the truth. 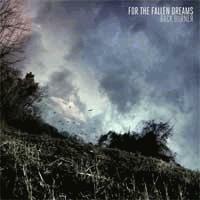 the cleans are annoying, the songwriting is weak and it's easily For The Fallen Dreams' worst album so far. sad development for them. I've never understood all the hate of this album. One of my favorite Metalcore releases. Not their best works by any means, but still not bad. This band does have good talent, but 2 of the members are now gone as mentioned before. There are some catchy choruses mainly "Deep Down Inside", but for the most part the cleans tend to feel forced and out of place at times. "Fist Fight" is the only song on the album without them, and is comonly referred to as the best track on the album. This should speak for itself right there. Hopefully after having some experience with this new lineup, FTFD will do better in their future endeavors. Relasing Wasted Youth in less than 2 years tells me that maybe they weren't happy with Back Burner. Hopefully they will have fixed their mistakes and returned to the great sounds of Relentless. As much as I really wanted to like this cd there its just painfully obvious that they won't be able to surpass their older work. With only 2 or 3 decent tracks it just leaves far too much to be desired. This was a huge disappointment for me. It sounds far more generic and commercial than their previous releases. Everything sounds like they took a step down on this album. The band simply matured. They made a record they are proud of. Despite the annoying clean vocals at times and the over usage of breakdowns I actually like this and I'm not really the biggest fan of these guys. I still think nothing will touch Changes. think they'll ever top 'Changes' in my eyes. Mice Duce's guest appearance is obviously the only thing that shines a litte bit through this big sea of mediocre.